This site is dedicated to recognizing and promoting the efforts of all schools and student/athletes throughout Riverside County. We hope to offer all coaches, student/athletes and parents a web site that they can continually go to for information regarding Prep Track & Field in Riverside County. Our main headliners here in 2017 did not disappoint at the 99th edition of the California Track & Field State Championships! Rancho Verde returned the talent needed to compete for the Southern Section Divisional Title along with the California State Title. Of course, those two plaques were collected by Great Oak and Vista Murrieta, respectively, in 2016. And as senior Cameron Samuel crossed the line to cement their 4x400 Relay come from behind victory, the fireworks in the sky served as a celebration for Rancho Verde in capturing both team titles here in 2017! Meanwhile, Riverside County's other seasonal headliner astonished us with her victories in both the 400 meters and 300 Hurdles. Of course, we're referring to Norco's Shae Anderson! She pulled off a feat that had never been accomplished in, arguably, the most impressive double for females in California State Meet history. Overall, Riverside County brought back more state champion medals than we witnessed in 2016! Seven individuals (five in 2016) ascended to the top of the championship podium while Rancho Verde earned that relay title in the longer relay. Before we get back to Rancho Verde's roller coaster of a weekend, no female has EVER dominated the prep landscape here in Riverside County like Ms. Shae Anderson! 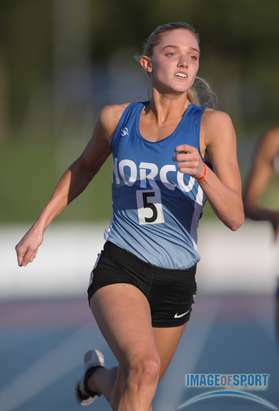 At Norco High, she settled in for a senior campaign that will NEVER be forgotten (or perhaps lived up to). With a strenuous racing schedule that extended back into January, the skeptics that said she wouldn't last until June were proven wrong! The skeptics that said that the two-day regime of the state championships would ultimately see her fall short of a title in the 300 Hurdles..... wrong! And to boot, the two titles she earned were with great competitors that pushed her all the way to the finish line in both victories. Already shattering our county record back in April with a 51.99 effort in the 400 meters, Anderson mustered up enough strength to break her own county record in the 300 Hurdles with a 40.31 victory! What's also impressive is that two other girls also broke 41 seconds, and she held off the top two returners from 2016. All of this AFTER holding off two other sub 53.40 girls for the win the title in the 400 meters less then 90 minutes earlier (and fighting a bout of broncitis the last several weeks)! Graduating the day before prelims, Anderson leaves the regular season atop our lists in the 100, 200, 400, 800 and 300 Hurdles. She is also part of EIGHT school records at Norco High, set here in 2017. She has gone out over 18'7" in the long jump and is an accomplished high jumper and javelin thrower. We will continue to chart her efforts from here on out, so stay tuned as she will focus on the 400 and 200 this summer. Perhaps a surprise to most, Riverside Poly junior Abigail Burke stepped to the apex of the podium in her own right. In already bringing home the Div. I CIF Title two weeks earlier, Burke was unscathed with no misses as they raised the bar up to 5-10. With all four competitors unable to clear that height, Burke emerged with the state title! Under the tutelage of High Jump coach, Robert Attical (who also coached three other state meet finalists the past three seasons at JW North), Burke will look to defend her title in 2018. The last Riverside County girl to earn a state title in the High Jump..... Chaunte Howard of JW North in 2001! Perhaps in the eyes of some, it was a downyear for our friends from the Southwestern League. With that being said, we still saw some hardware travel back down south from the state meet! We referenced that 100 meter race earlier, but now time to give Vista Murrieta's Javelin Guidry his due. With the 3rd time being the charm, Guidry stormed out of the blocks for an early lead and continued to dominate down the track with a new state meet and county record, under all conditions, with his 10.13 conquest! This was the fastest time in California State History (under all conditions) as it broke the 10.17 set by Quincy Watts back in 1987! It also shattered the State Meet record of 10.30, set back in 1992! Guidry is also the first to ever capture state titles in Texas and California. This is also the 3rd straight season Vista Murrieta has had an individual champ in the sprints (Norman just missed in the 400 meters back in 2014). Earlier, Guidry's eye popping 2nd leg put his crew in the lead on the 4x100 relay. The 2016 champs held on well for a 3rd place finish in the 400 meter relay, despite graduating three legs off of last year's squad! Running a great 3rd leg on that same relay, junior Parris Samaniego ran to a 5th place finish in the 400 meters and will return as one of the best in California in 2018. On a special note, one of our greatest sprinters in county history and two-time state meet medalist in the 100 meters and a huge part of those 2015 and 2016 state team titles, Cole Dubots, was the lead off on that relay. Earlier this season, Great Oak junior CJ Stevenson emerged as one of the best in the state for the Triple Jump, just like his sister had been in previous seasons. Unfortunately a 'NWI' reading, his 50-4 effort in late April elevated himself as THE favorite. Over a month later and CIF Divisional and Masters Meet titles, Stevenson took the lead in the second round at Saturday's finals. Leading by almost three feet after four rounds, no one could challenge his 49'9.75" wind legal 3rd round attempt. Relatively speaking, this was largest margin of victory of ANY event at the 2017 State Meet. Also making the trip up to Clovis for the Wolfpack, senior Solomon Fountain qualified for the 1600 state meet finals for a 2nd year in a row. In the pack with the leaders with one lap to go, Fountain finished 5th in the race, despite a sub-60 second last lap! Fountain graduates as running the #9 time in county history. Also with a deadly kick, junior Carlos Carvajal will take over the reigns from Great Oak next year as he took 8th place in the 3200 meters. Representing their women, senior Evelyn Mandel leaves us as one of the greatest distance runners in county history. Fighting all the way down to the wire, Mandel captured that 6th place medal as secured her place on the podium. She leaves us as #7 all time for this event and #13 for the 3200 meters. A huge part of four CIF and State Championships in Cross Country, to go along with a CIF Div. I Track team title in 2016, whilewalking away a state meet medal in the 1600..... heck of a resume! We also want to recognize the incredible improvement of Jeremiah Ruger as he also qualified for the Riverside County dominated 300 Hurdles final and leaves us with the #7 all time mark in county history. Graduating as one of the greatest athletes in Riverside County History, Roosevelt's Anthony Easter leaves us in earning 2nd, 3rd and 4th place medals at this year's State Championships! After not advancing past the 2016 Divisional finals, Easter was as consistent as anybody this season. Easter's 13.91 4th place personal best in the 110 Hurdles moved him up to #4 on our all-time FAT list for the higher hurdles! In what should be a nice collegiate career in the 400 Hurdles, Easter finished 3rd place, by only .005 to RV's Samuel in the 300 Hurdles. (Samuel also outleaned him in Friday's prelims by .002 in the 110's). Easter's 36.34 will go down as a three way tie for #3 on the all-time Riverside County list for those longer hurdles! (down from a 37.75 hurdler in 2016) In what became an epic matchup between both hurdlers in the longer relay, Easter rallied his squad into 1st place on that anchor leg of the longer relay. In yet, another sub 47 second effort, his crew settled for 2nd place in California with a sub-3:15 effort in the 4x400 relay. This is #14 on our all-time list but #4 on their school's list! Representing the Roosevelt women, junior Breanna Bernard-Joseph earned two individual medals in both hurdles as well. She was part of THE fastest 100 meter hurdle race in national history as 13.87 did not even medal! BBJ's wind-aided 13.78 effort captured that last spot on the podium to go along with her 13.72 the night before. After taking the 2nd place medal in 2016 for the 300 Hurdles, it was tough to have the #1 girl in California emerge within your own league, seemingly out of no where. But, Breanna NEVER backed down from the challenge, capturing her 2nd straight Div. 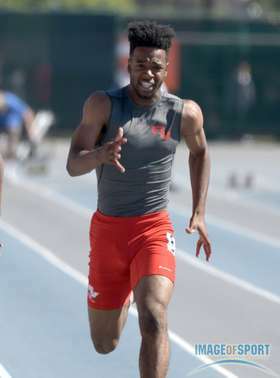 I CIF Title two weeks ago and advancing to another state meet. Her 4th place finish may seem like a disappointment but rest assured that she will be back to break 41 seconds next year. Looking back, it seems as if Valley View's Josh Johnson was off of our radar all season long. For the record, he wasn't but we will admit that we did not forsee him elevating his game this past month like he did! Finishing amongst the top seven in both throws at this year's state meet is a huge accomplishment, as he improved out to a 190'11" in the discus. This earned him the 5th place medal and all the way up to #6 in Riverside County history! Despite being the last qualifier into Saturday's final with only a 53'8.25" marking, Johnson moved up to finish 7th in the Shot Put with a 59'5.75" just off of his personal best. The much improved program at Temecula Valley yielded them two medalists in the hurdles! Junior Danae Dyer qualified for her 2nd straight 100 Hurdles final and was part of that barrage of sub-14 second finalists. Her 14.12 yielded her an 8th place finish with a year to go. We questioned Qwintin Workman's decision to drop the 400 after earning the SWL title a month ago, but now admire the decision. He 'worked' his way up to a 37.26 effort to make his way to the podium in the 300 Hurdles. Only #4 in Riverside County for 2017, Workman tied the #8 mark ever in Riverside County history! Rounding out those Riverside County athletes that finished amongst the top 8, ML King sophomore Lauren Peurifoy got a taste of the big stage here in California for the 3200 meters. In what became a negative split race for the ages in competing for spots on the podium, Peurifoy ran a 10:31, almost a minute faster than she finished with in 2016! Her splits were 5:15.24 as she came back with a 5:15.94! Watch out for her this Fall in Cross Country! ER's Anthony Easter and RV's Cameron Samuel.... Long Lost Brothers? The Southern Section Masters Meet - where the top entries from the previous week's Divisional Finals come together and decide which athletes and relay squads will represent the Southern Section at the 2017 California State Championships. Some would like to see the process altered, some feel that it can easily be expanded to include additional opportunities for more athletes while there is a contingent of coaches that would like to see it eliminated. Either way, it remains the final chance for the very best to qualify onward. Over this past decade, we've been blessed to see Riverside County dominate this meet and command more attention from the other areas within the section. Whereas it seemed that only JW North was consistently qualifying kids to the state meet some 15 years ago, the Masters Meet has become a popular stage for our very best locals to shine! Our Riverside County boys captured 23 individual entries to go along with four relay entries. The men of Rancho Verde kept their squad in tact en route to being heavy favorites to keep the Boys' State Championship Trophy here in Riverside County (Vista Murrieta has won the previous two team titles). Despite losing Rasaun House in the 100 meters due to untimely wind conditions at the Div. I Finals meet, the rest of the squad remains and increasing their projected point total with every meet this postseason! Baylor-bound senior Isaiah Cunningham brought his squad home for the victory in the 400 Relay once again at 41.14. Meanwhile, after being out muscled in the 100 meters by Vista Murrieta's Javelin Guidry, 10.35 to 10.41 (+2.2w), he came back to rule the 200 in 21.52 as they had to run into a -1.9 wind. The Cal State Fullerton-bound House was 4th in that 200 at 21.63. 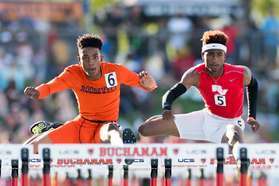 Progressing well through the season, USC-bound Cameron Samuel stayed under the radar for most of March, reminded us why he took 2nd at last year's state meet in the 300 Hurdles in April and now has emerged as one the dual hurdling threats in California. His 13.85 wind legal runner-up finish in the 110's is where we've seen the most improvement as he is now #3 in Riverside County History. (He did not advance to the divisional finals a year ago) Meanwhile, he easily qualfied in the 300's with a 3rd place, 37.03 effort. Bouncing between the long jump and the 400 relay, Bryan Thompson popped off a 23'8" effort on his 2nd attempt to secure the automatic spot onward. Closing out the evening, the Mustangs ran their 'B' squad in that 4x400 squad and still qualified in 6th place to move onto next weekend. It got a little dicey there for a bit but they pulled away on that last lap. Any other year, we would be mentioning the accolades of Roosevelt's Anthony Easter. The UC Davis bound hurdler truly shined at his best with a sub-47 split to anchor his 4x400 squad to the victory. After a disappointing CIF Finals in 2016, he took 4th in the High Hurdles (14.04) while coming back for a 37.32 qualifying effort in the 300's before uncorking that anchor relay leg. Also on that relay squad, Julian Robles qualified in the 800 meters as well. Junior Tyler Spencer is one of the most improved distance runners in the state as he rolled over that last lap into that last and sixth place automatic qualifying spot (9:09.22). He held off fellow Big VIII league qualifiers in Centennial's Trevor Woodward and teammate Raymon Ornelas in the process. Vista Murrieta's boys, for the 3rd year in a row, qualified their 400 Relay squad in taking 6th place with an automatic spot at 41.66. Afterwards, junior Parris Samaniego moved from 6th place up to 2nd over the last 120 meters to also move on in that 400 meters. The aforementioned Guidry got out to a great start in that 100 meter victory while holding off Cunningham. He had been 0-3 in previous matchups. Staying within the Southwestern League, University of Columbia bound, Solomon Fountain represented Great Oak, moving onto his 2nd state meet with a season best of 4:11.88! Junior Carlos Carvajal dropped the 1600 to focus solely on the 3200, and it paid off with a 9:08 negative split 5th place effort. Jeremiah Ruger qualified in that loaded 300 Hurdles (37.23) where four of the top seven hailed from Riverside County. Inside the oval, junior CJ Stevenson continues to carry the name forward to another state meet effort. He automatically qualified on his 2nd attempt, but punched forward with his 48'9" victory. Temecula Valley's Qwintin Workman decision to drop the 400 in the postseason paid off as despite finishing in 7th place, his 37.69 was under at-large 38.29 standard. Individually, Elsinore's Anthony Reyes qualified in both the Long and Triple Jumps. With Riverside County capturing victories in those events, Reyes shined on his own in both. He was 2nd place after two attempts in the TJ while holding onto that sixth and final spot. In the long jump, there was no suspence as he flew out to a 22'9.5" qualifying effort on his first attempt. Also moving forward in two events is Valley View's Josh Johnson. He qualfied in the Shot Put on his first attempt while only taking one other throw. Meanwhile, Johnson met the at large mark on his 2nd attempt in the Discus at 170'2." In the shadows the other dominate distance programs here in Riverside County, Rubidoux's Erik Gonzalez continues to back up his impressive resume. Arizona State bound, he looked very much in control all throughout in rolling to a 9:08.39 fourth place effort. Also in the shadows perhaps... Corona's Enrique Villa. While focusing on the mile all year long, some would say that he shouldn't be in the 800! A kicked off shoe snafu at league finals with 200 meters to go allowed Villa to move up to 3rd place. After looking at the lack of depth amongst in the Southern Section 800 meters, he decided to only focus on this event. With the decision seemingly paying off, he was in 9th place with 300 to go. But burst into the lead with less than 100 meters to whild holding on for 2nd place to advance onto the state meet! Norco's Shae Anderson has been the headliner all throughout the 2017 campaign and why should anything be different here at the Masters Meet! Fighting a case of broncitis the past two weeks, Anderson's strength persevered and got her through this round, albeit with victories in one of the toughest doubles you will see! But, also impressing was league foe, Roosevelt junior Breanna Bernard Joseph. BBJ qualified once again in both hurdles for the 2nd year in a row (3rd for those 300's). She also ran another great anchor leg on her squad's 4x400 relay as they took 4th place to move onto another state meet berth in that event. In that same relay, Corona moved on as well. The school's first relay team to ever advance onto the Masters Meet, the girls delivered and move forward with another 3:49 effort. Staying with the Big VIII league, ML King's Lauren Peurifoy became the first girl in school history to advance in the 3200 meters. In showing just how deep and talented the state is in this event, she was 7th place with 300 meters to go but kicked hard to take sixth. But, all seven girls ran under 10:29! In relation to past seasons, it was a surprise to see only three girls advancing from the Southwestern League. In what has become commonplace for Great Oak though, they advanced TWO girls from the mile. Before they head off to college, TCU bound Evelyn Mandel came up big with a great last lap, and a 4th place finish! Up until 2011, her time would have been the Riverside County Record! In moving up to #7 on our all time list, she is only fifth on the Great Oak school record list!!!! (She just missed also qualifying in the 3200 meters by a mere 4 seconds). Fellow senior, Washington State bound Kiyena Beatty also punched her ticket onward with sixth place finish and a new personal best. The only other entry for the league was Temecula Valley's Danae Dyer. Despite a frustrating season, her talent carried her onward with a fifth place, 14.21 effort. She was 7th at last year's state finals. Finally, Riverside Poly's Abigail Burke continues to dazzle in tying for first place in the High Jump. She cleared the automatic state meet mark with NO misses and called it a night at that point. Just missing a 3rd trip to the state meet by a mere .20 was Centennial junior Riley Penn. After taking a good portion to heal from injury, Penn still broke 2:12 but the at large state standard for that event has improved more than any other event over the past two seasons! Great Oak's Nicole Rice closed out one of the greatest Riverside County distance careers by just missing the standard and the 3200. Rancho Verde Keeps the Title here in Riverside County! Great Oaks boys walked away with a runner-up plaque! The duo of Solomon Fountain and Carlos Carvajal earned 34 points by themselves! Despite the 90+ degree temps that hindered ALL distance marks, Fountain (in Cortesque fashion), captured the 1600 (4:14.47) and the 800 meters (1:55.10)! With Fountain leaving everybody to suffer over the last 250 meters, training partner Carvajal joined him to take 2nd in that 1600 (4:16.27) while he impressed with a 3rd place finish in the 3200. While Carvajal was in the 3200, fellow junior CJ Stevenson was embarking upon his own CIF Title with a wind-aided 48'3.25" victory. Meanwhile, Jaime Navarro and Harrison Gould both qualified for the Masters Meet in the Shot Put while finishing 2nd and 3rd, respectively and earning their squad an additional 14 points. Vista Murrieta's boys started the day with a 2nd place finish in the 400 relay behind Rancho Verde. Their 41,62 effort easily qualified onto next week's SS Masters Meet. Vista Murrieta junior Parris Samaniego challenged to the finish with his 2nd place finish (47.65) in the Div. I 400 meters. Fellow Bronco, Javelin Guidry challenged for the title in that 100 meters, but settled for the 2nd place medal. He finished the day by earning a 4th place medal in the 200 meters. Roosevelt's boys also impressed as they were headlined by their 2nd place finish in the 4x400 relay. Their anchor, Anthony Easter had already taken 3rd in the 100 Hurdles and was pushing for the victory in the 300's until he clipped the 6th hurdle. He recovered well and moved on, albeit a 'what could've been' 4th place finish. Teammate Julian Robles also qualified for the Masters Meet with his 3rd place finish in the 800 meters. Overall, they took 3rd place overall for Division I. Their 3:15.73 runner-up effort in the 4x400 is now the #15 mark in Riverside County history. For the Division I Boys, Riverside County captured ten of the 16 events with a runner-up spot in three others (both hurdles and 400) . Teamwise, the top three squads and five of the top eight hailed from Riverside County. Valley View senior Josh Johnson stepped up, perhaps, bigger than anybody here with his 181-11 personal best to easily win the Discus while then coming back to capture the Shot Put by almost four feet and a three foot PR! Johnson is now #15 all-time on the Riverside County list in the Discus and #17 for the Shot Put. Trust us - it wasn't all about the Boys. Our shoe in for 2017 Athlete of the Year, Shae Anderson of Norco, persevered on this day. She captured the Div. II CIF Titles in both the 400 meters and 300 Hurdles. Don't overlook that this is one of the toughest doubles to successfully accomplish. (after the 400, she was limited with severe asthma, but bore down to hold onto a late charge in the hurdles). Her Big VIII counterpart, Roosevelt's Breanna Bernard Joseph defended her CIF Title in the 300 Hurdles with the fastest time of the day while anchoring her squad to a CIF Title (and fastest mark) in the 4x400 Relay. BBJ also delivered a runner-up performance in the 100 Hurdles. Also representing the girls from the Big VIII league, ML King sophomore Lauren Peurifoy held off a late surge to capture the CIF Title in the 3200 meters. She emerged with the #2 time of all sections in the process. (2 x CIF Title in the same event from the same league = odd feat). Riverside Poly's Abigail Burke elevated up over 5'7" to capture the Div. I CIF Title in the High Jump. Meanwhile, La Sierra's Mariah Allain outleaned for the 2nd place finish in the Div. III Girls 200 meters (12.09). Linfield Christian's Aarika Oeleis also earned a runner-up medal in the Div. IV 100 Hurdles (15.07) all the way out of lane nine. Under the radar, Xavier Prep's Taylee Undem caputured 2nd place in the Div. IV Triple Jump with a 35'6" (into a -3.1 wind) to go along with her 3rd place medal in the Long Jump (17'6"). Undem qualified for the Masters Meet in the Long Jump. One the team side of the equation - Great Oak's girls once again dominated the distances unlike what we have EVER witnessed. Looking to defend their 2016 title, Long Beach Poly simply had too much fire power in the sprints and jumps. All the same, the quartet of Kiyeanna Beatty, Nicole Rice, Evelyn Mandel and Sandra Pflughoft earned 36 points! Beatty took 2nd in the 1600 while Mandel ran a great last 400 to take 2nd in the 3200. Mandel was only one of three girls to qualify for the SS Masters Meet in two distance events. Deja Alexis (3rd place in Triple Jump) and Kolonnie Green (5th place in 300 Hurdles) contributed more points to the additional plaque to add to their arsenal..
-Charisma Davis (Temecula Valley) 17'3.25"
-Deja Alexis (Great Oak) 37'2.25"
-Zion Levi (Rancho Verde) 39'5"
-Victoria Soto (Shadow Hills) 122'8"
-CJ Stevenson (Great Oak) 23'3.5"
-Jaime Navarro (Great Oak) 56'1"